In some instances gamers just like to have a good old fashioned brawl against a group of bad guys, and go through a whole gauntlet to prove just how tough they are in the fighting game genre. 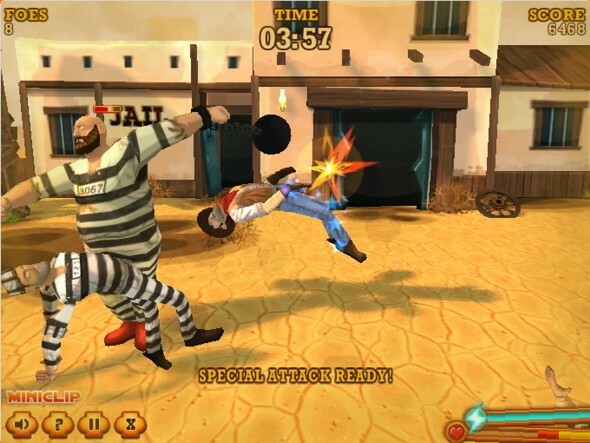 That would define the key element of Saloon Brawl 2, the sequel to the highly successful Saloon Brawl game. 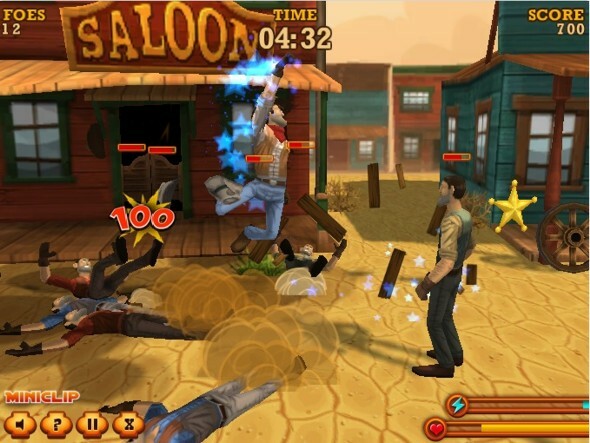 In Saloon Brawl 2 you play the role of a sheriff in the Wild West, trying to restore order in every place you step foot in. The problem is that no matter where you go a brawl will break out. 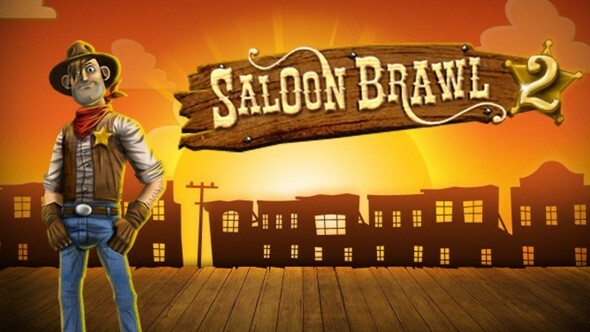 The controls of Saloon Brawl 2 are very simplistic as all you need to do are to use the up, down, left and right arrow keys on your keyboard to move around, press the Z key to block any punches that come your way, press the X key to dish out your own punches, or press the C key to either grab enemies or pick up objects. The unique thing about this game is that you will have the ability to break out a special attack against as many enemies as you like. Just like other actions taken by players in this game the special attack is simple to use as you just need to press the spacebar. Whenever your special bar is completely filled up, which you can check on in your inventory, you can press the spacebar to dish out a spinning uppercut punch. There are only 7 levels in Saloon Brawl 2, but all these levels will keep you busy as they will slowly increase in difficulty. Level 1 is where you fight against outlaw cowboys in the middle of a town. Level 2 is where you fight just outside the County Jail, pitting you against convicts, including a big brute who swings a ball and chain. Levels 3 and 6 require you to protect innocent civilians such as a cheerful pianist and 2 girls you would normally see in a Wild West themed casino. In each level you will only be given 5 minutes to defeat every enemy that picks a fight with you. There are time bonuses for completing levels as quickly as possible. When it comes to the game’s rewards, knocking out an enemy would be the main source of receiving rewards. In most cases you will receive 100 points for knocking out an enemy, but you can also get bonus points if you collect golden sheriff badges that scatter throughout a level. The more successful you are at beating up enemies, the more your special bar will fill up. However, beware of the fact that you can get hit yourself which is why the game places some health items for you to collect as well. Sometimes you will need to refill your health bar. 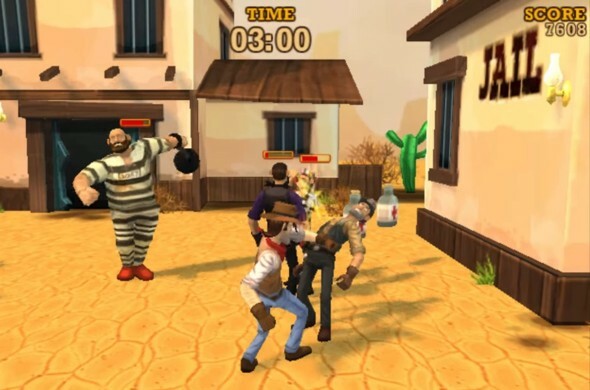 Saloon Brawl 2 is pleasantly presented in an upbeat cartoony way, reminiscent of animated movies like Toy Story, which featured Sheriff Woody. The 3D graphics are polished and nice to look at considering this is a flash game. While they remain true to the Wild West theme, many of the characters that were made for this game look like they were very well thought out. The music this game featured was catchy and captured the feeling of brawls in the saloon. The only thing that might concern gamers is the increasing difficulty of this game, especially in the later levels. If you can handle the difficulty spikes, which aren’t huge leaps and bounds,, then you will enjoy this game. One point of advice would be when you see two enemies fighting each other, let them fight for a while because they are not focused on fighting you. I recommend playing Saloon Brawl 2.